The sweet taste of pears at any meal is a great treat. This fruit provides a good source for vitamin C which boosts your immune system. Vitamin C helps prevent infection in your soft tissues including your gums. These amazing veggies are full of great vitamins! Rich in B6, bell peppers will also give you your full daily serving needs of vitamins A and C. Vitamin A strengthens teeth and gum tissue and helps speed up the healing process in your oral cavity. Crisp cucumbers are a wonderful source for magnesium, potassium, and fiber. Magnesium is an essential mineral for oral health as it can help strengthen enamel. Potassium builds strong bones and teeth. The fresh leafy vegetables at the farmer’s markets are ideal sources for vitamin K which aids your body in fighting against substances that are known to decrease bone density. Dark greens such as spinach and kale are plentiful right now and perfect for your dinner plate. At our Ross Township dentist office, we associate apricots with cake. No, not that cake. 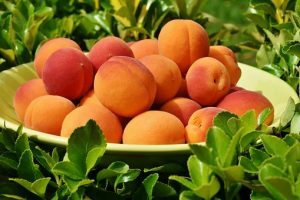 Apricots are rich in vitamins C, A, K, and E. They aid in skin and heart health, and help keep your oral cavity in great shape. Fresh apricots pack the biggest punch without having to add sugars and starch to your diet. Farmer’s markets are full of great fruits and vegetables right now. Take advantage of all they have to offer so you can keep yourself and your mouth in good health. Color your plate with a rainbow of colors to get the most of the foods’ vitamins and minerals. Talk with us at your next Ross Township dentist appointment about your favorite fresh produce or share your recipes with us on social media.